International Master Dionisio Aldama has perhaps found a new home after living in Mexico for the past 10 years. The Cuban-born national recently moved to Phoenix, Arizona and took part in the North American Open in Las Vegas. Having been inactive for a couple of years, Aldama was looking to find a groove in a tournament boasting 15 Grandmasters and a host of IMs and FMs. Hikaru Nakamura ended at the top of the charts with an undefeated 6-1 which was good for US$6940.00. Last month, he won the National Congress in Philadelphia. Tied for joint 2nd were GMs Vadim Milov, Zviad Izoria and Alexander Shabalov with 5½-1½. Twelve-year old phenom Ray Robson continues to soar and tallied 5-2 including a win over GMMelikset Khachiyan. After losing to GM Ildar Ibragimov in the second round, Aldama reeled off three consecutive wins (Emory Tate, Miles Ardaman, Andrew Boekhoff) before holding level with GM Varuzhan Akobian. 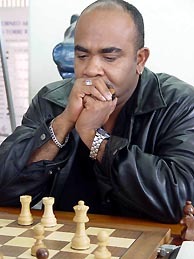 In the last round he faced Shabalov and lost on the black side of a wild Najdorf to end with a 4½-2½ score. In that game, Aldama had to fend off a speculative piece sacrifice, but consolidated and was close to winning. Crucial mistakes in time pressure allowed Shabalov tactical shots and Aldama collapsed. According to David Allen, who spoke to Aldama through an interpreter, Aldama is looking to restart his tournament participation here in the US and is looking for students, simultaneous exhibitions, and other chess activities.